Drug Development & Delivery recently spoke with several companies that are debunking that theory and developing innovative platform technologies for a range of therapeutics. Argos Therapeutics is an immune-oncology company developing individualized immunotherapies for the treatment of cancer using its Arcelis® technology platform to capture mutated and variant antigens that are specific to each patient’s disease. This precision immunotherapy technology is potentially applicable to a range of different cancers and is designed to overcome many of the manufacturing and commercialization challenges that have impeded other personalized, cell-based immunotherapies, says Dr. Nicolette. 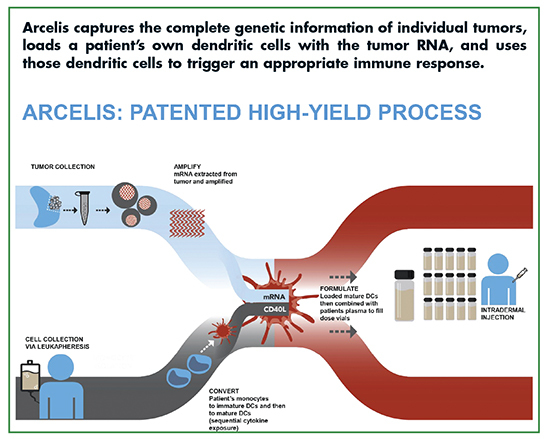 The Arcelis process uses only a small tumor or blood sample and the patient’s own dendritic cells, which are optimized from cells collected by a leukapheresis procedure. The activated, antigen-loaded dendritic cells are formulated with the patient’s plasma and administered via intradermal injection. A single production run makes enough product to continuously treat the patient for several years, and Argos has developed an automated manufacturing process to support post-launch commercial demand. Argos’ most advanced Arcelis-based product candidate, AGS-003, is being evaluated in a pivotal Phase III ADAPT clinical trial for the treatment of metastatic renal cell carcinoma (mRCC), and in ongoing investigator-initiated Phase II trials in neoadjuvant renal cell carcinoma and adjuvant non-small cell lung cancer. Argos believes its Arcelis technology platform can also be used to create immunotherapies for other chronic infectious diseases that don’t respond to current treatments. The company has been awarded a National Institutes of Health (NIH) contract to develop AGS-004, an Arcelis-based product candidate currently being evaluated in an investigator-initiated Phase II clinical trial aimed at HIV eradication in adult patients. 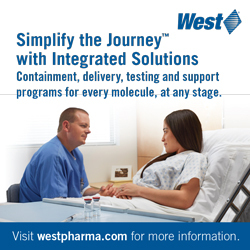 Targeted drug delivery to the lower gastrointestinal (GI) tract is difficult to achieve. Assembly Biosciences’ GemicelTM is a patent-pending platform technology that allows for targeted delivery of a range of agents in an oral capsule to the GI tract, including the colon. Gemicel’s novel formulations, coating and encapsulation technology, and dual-release system are designed to enable oral targeted delivery of live biotherapeutics, such as vegetative bacteria and bacterial spores, vaccines, complex macromolecules, and genetic materials, as well as small molecules and other agents. Recent human clinical scintigraphy studies performed by Assembly have confirmed that Gemicel can successfully deliver bolus doses to specific regions of the lower GI tract. Assembly believes scale-up and manufacture of the Gemicel delivery technology to be straightforward, efficient, and cost-effective. Gemicel capsules do not require refrigeration or special handling. Gemicel achieves its targeting effects by leveraging parameters that vary in different parts of the GI tract, especially changes in pH. The Gemicel capsule is formulated to release its therapeutic payload in targeted sections of the GI tract based on their characteristic pH levels. In addition, Gemicel capsules have inner and outer compartments that can be designed to dissolve at different pH levels, making it possible to deliver two doses of drug in two locations, or to deliver two different therapies to different parts of the GI tract using a single capsule. Assembly conducted a proof-of-principle Gemicel clinical study in healthy volunteers. The study used radioisotope-based scintigraphy to precisely image the drug delivery properties of Gemicel. 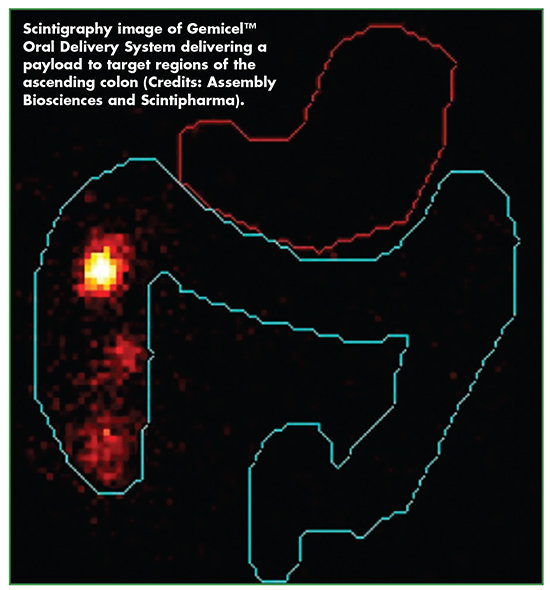 “The scintigraphy study confirmed that Gemicel can effectively deliver a bolus payload to specific locations in the lower GI tract, and suggested that Gemicel can yield higher and more reproducible doses compared to conventional approaches, and that its capsule formulation process is scalable and affordable to produce,” says Assembly’s Mohan Kabadi, PhD, Vice President, Pharmaceutical Development. Assembly intends to use the Gemicel technology to deliver its investigational microbiome therapy to treat recurrent C. difficile infections, which is expected to enter clinical trials later this year. The company is also using its microbiome platform to develop additional product candidates for use with Gemicel. “We are also interested in partnering with other companies to develop therapies that might benefit from Gemicel’s attributes,” says Micah Mackison, Vice President, Corporate Development & Strategy at Assembly. Celsion is an oncology company dedicated to the development and commercialization of cancer drugs based on two clinical-stage technology platforms. The most advanced program is a heat-mediated, tumor-targeting drug delivery technology that employs a novel heat-sensitive liposome. The technology is engineered to address a range of difficult-to-treat cancers. The first application of this platform is ThermoDox®, a lyso-thermosensitive liposomal doxorubicin (LTLD), whose novel mechanism of action delivers high concentrations of doxorubicin to a region targeted with the application of localized heat above 40°C, just above body temperature. In one of its most advanced applications, LTLD, when combined with radio frequency thermal ablation (RFA), has the potential to address a range of cancers. For example, RFA in combination with ThermoDox has been shown to expand the “treatment zone” with a margin of highly concentrated chemotherapy when treating individual primary liver cancer lesions, explains Michael Tardugno, Celsion’s Chairman and CEO. The goal of this application is to significantly improve efficacy. Administered intravenously, LTLD is engineered with a half-life to allow significant accumulation of liposomes at the tumor site as these liposomes recirculate in the bloodstream. Drug concentration increases as a function of the accumulation of liposomes at the tumor site when activated by heat above 40°C. Once heated, the liposomes rapidly change structure when the liposomal membrane selectively dissolves, creating openings that quickly release a chemotherapeutic agent (doxorubicin) directly into the tumor and into the surrounding vasculature. This occurs only where the heat is present, supporting precise drug targeting. “Our first drug utlilizing the platform, ThermoDox, is agnostic to the heating device and is designed to be used with a range of hyperthermic treatments, such as RFA, microwave hyperthermia, and high-intensity focused ultrasound (HIFU),” says Dr. Borys. ThermoDox is currently in a Phase III clinical trial for the treatment of primary liver cancer, The OPTIMA Study; and a Phase II clinical trial for the treatment of recurrent chest wall (RCW) breast cancer, The DIGNITY Study. Results from Celsion’s recently completed Phase I/II US Dignity study of ThermoDox, in combination with mild hyperthermia in patients with RCW breast cancer, showed patients treated with ThermoDox demonstrated a combined local response rate of 61.9%. The latest overall survival (OS) analysis for primary liver cancer demonstrated that in a large, well bounded, subgroup of patients, treatment with a combination of ThermoDox and optimized RFA provided an average 58% improvement in OS compared to optimized RFA alone. Median OS for the ThermoDox plus otpmized RFA translated into a 25.4-month survival benefit over optimized alone. 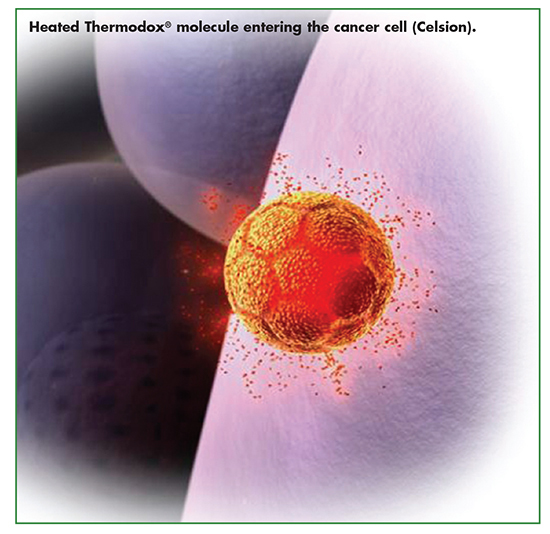 In addition to ThermoDox, Celsion is applying LTLD technology to develop liposomal formulations of docetaxel and carboplatin. Celsion also continues to invest in liposomal technology, developing proprietary formulations of other marketed chemotherapeutics. PETization is the proprietary platform technology of veterinary therapeutic biologics company Nexvet. It rapidly converts monoclonal antibodies (mAbs) among species, with the end products being 100% species-specific. Nexvet has clinically validated PETization in dogs, cats, and horses with its portfolio of anti-nerve growth factor (NGF) mAbs. PETization also has applications beyond pet biopharmaceuticals. The rapidity of the process (which does not use traditional time-consuming mAb design processes like CDR grafting or iterative affinity maturation) means that PETized mAbs can be created (and in vivo proof-of-concept studies entered) very quickly, explains Dr. Heffernan. Nexvet is also interested in investigating how veterinary medicine can be used to inform (and benefit from) the development path of new and existing treatments in human health. Dogs, in particular, are susceptible to many of the same diseases and pathologies that afflict humans, such as diabetes, cancer, and inflammatory disease. Clinical studies in animals with disease, therefore, can be a useful intermediary between traditional preclinical models and human clinical trials. These proofs-of-concept are usually performed with mouse mAbs in engineered mouse models of disease with sometimes questionable validity for human disease, says Dr. Heffernan. Thus, Nexvet is exploring research collaborations whereby human pharma partners can benefit from rapid entry to better proof-of-concept studies, and Nexvet can benefit by developing new mAbs for PETizing and clinical assessment, in the pursuit of new veterinary therapies. In addition to its pivotal-phase portfolio of anti-NGF mAbs ranevetmab (NV-01) and frunevetmab (NV-02) for the treatment of chronic pain in dogs and cats, respectively, Nexvet is advancing PETized anti-PD-1 mAbs in collaboration with Japan-based Zenoaq, for the treatment of canine cancers. PD-1 is an immunooncology target, which in human development, has led to the approved human drugs nivolumab (Opdivo®) and pembrolizumab (Keytruda®). Nexvet is also advancing PETized dog and cat mAbs against tumor necrosis factor alpha (TNF), the target of the approved human anti-inflammatory drugs infliximab (Remicade®) and adlimumab (Humira®), and is investigating mAbs for allergic conditions against undisclosed targets. Marine organisms present potent compounds with potential to be the next blockbuster cancer drug, the newest weapon in humanity’s fight against antibiotic resistance or a novel non-opioid pain medicine. But identifying these unique compounds and understanding how they might work as a drug is a complex task requiring specialized training and equipment. After obtaining biological samples from remote marine environments, scientists must isolate and understand the chemistry of novel marine-derived compounds. Marine compounds tend to be more chemically unique and less amenable to lab synthesis or fermentation. 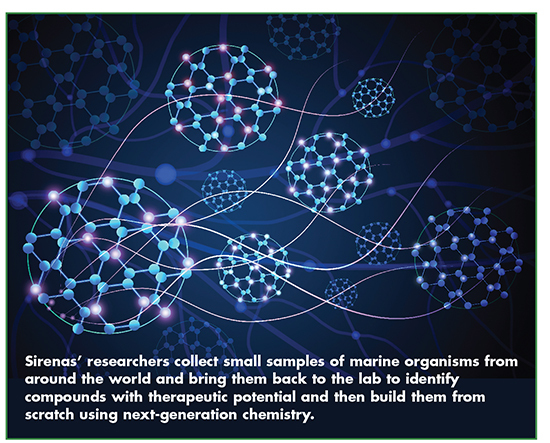 To significantly accelerate the process of marine-inspired drug development, biotechnology company Sirenas has developed the Atlantis™ platform, a data-driven approach to documenting, analyzing, and synthesizing compounds that show promise as a medicine. In the case of Sirenas’ lead antibody drug conjugate payload, SMD-5033, the company spent less than 9 months to isolate and characterize the marine-derived compound, analog it to see how it may be applied in a therapeutic setting, synthesize it, conjugate it with several antibodies, and then prepare it for in vivo trials. At the heart of the Atlantis platform is an ultra-efficient database and software platform. Sirenas isolates and chemically analyzes compounds and tests the samples in a range of biological disease assays. The data is uploaded into the platform, which contains the digital fingerprint of Sirenas’ entire chemical library of more than 25,000 drug-like fractions of compounds. Because the analytics software can combine the rich chemical data with High Throughput Screening (HTS) results and other biological and biomedical profiles, modern statistical, machine-learning, and metabolomics algorithms can be deployed to rapidly identify promising starting matter for nearly any disease system or biological assay. Once a lead compound is identified, the marine-derived compounds are synthesized in the lab. Sirenas’ team replicate, iterate, and fine-tune the complex chemical structures of the molecules, creating new compounds to advance to the clinic. In addition to developing its own drug candidates, Sirenas partners with pharmaceutical and biotechnology companies who wish to leverage the Atlantis platform. Current partnerships include programs for discovering new ADC payloads, and discovering and developing novel small molecules for immune-oncology and infectious disease. Sirenas is actively seeking new partnerships. Vical Incorporated develops biopharmaceutical products for the prevention and treatment of chronic and life-threatening infectious diseases. 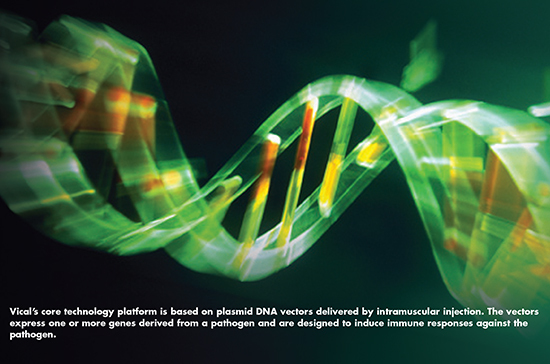 The company’s core technology platform is based on plasmid DNA vectors designed to express various proteins of interest after injection into muscle tissue. The plasmid DNA contains gene expression elements to regulate high-level expression of any gene sequence that is genetically engineered into the vector. Vical’s major focus has been in developing therapeutic and prophylactic vaccines for the treatment of infectious diseases. There are key advantages to using plasmid DNA-based vaccines, says Larry R. Smith, PhD, Vical’s Vice President of Vaccine Research. First, plasmid DNA is manufactured by a relatively simple fermentation process in E. coli and doesn’t require handling any pathogen. A powerful manufacturing attribute is that only a single manufacturing process is required regardless of which gene sequence is encoded by a plasmid DNA. Second, vaccine stability (a limitation with some live-attenuated vaccines) is not an issue with plasmid DNA vaccines as they can be stored frozen for long periods with minimal loss of potency. Finally, plasmid DNA vaccines can elicit both arms of the adaptive immune response (T-cell- and antibody-mediated responses) in contrast to inactivated and protein subunit-based vaccines that generally elicit high levels of antibody responses. To create a plasmid DNA encoding the gene of interest, standard genetic engineering/cloning techniques are used with a plasmid vector backbone that has been optimized by Vical scientists; the gene sequence is synthesized to create a codon-optimized version that is designed for maximum expression. The plasmid DNA is combined with specific excipients to create the final drug product for a given indication. Dr. Smith states that two plasmid DNA products using this platform technology are undergoing advanced clinical testing. The lead program is a Cytomegalovirus (CMV) vaccine, ASP0113, being developed in partnership with Astellas Pharma. ASP0113 is being tested in a global Phase III trial in approximately 500 hematopoietic stem cell transplant recipients who are at high risk of developing CMV-associated disease and complications. Phase II trial results found the vaccine significantly reduced CMV viremia. ASP0113 is also being tested in a global Phase II trial in 150 high-risk subjects undergoing kidney transplantation. The second product is a therapeutic HSV-2 vaccine candidate that was tested in a first-in-human Phase I/II trial. The bivalent vaccine significantly reduced genital herpes lesion rates in this study, and a Phase II trial is planned for further evaluation. In addition to these programs, Vical is under contract with the Pox-Protein Public-Private Partnership for the development of an HIV vaccine. Vical will manufacture HIV plasmid DNA vaccine to be evaluated as a priming component of a prime/boost vaccine regimen in a planned Phase I trial. XBiotech is a fully integrated global biosciences company dedicated to pioneering the discovery, development, and commercialization of therapeutic antibodies based on its True Human™ proprietary technology. XBiotech was founded on the belief that cutting-edge medicines should work in a targeted way to make patients feel better, not worse. With this guiding principle, XBiotech has created a new class of antibody therapies called True Human, which are derived without modification from individuals with natural immunity to specific diseases. 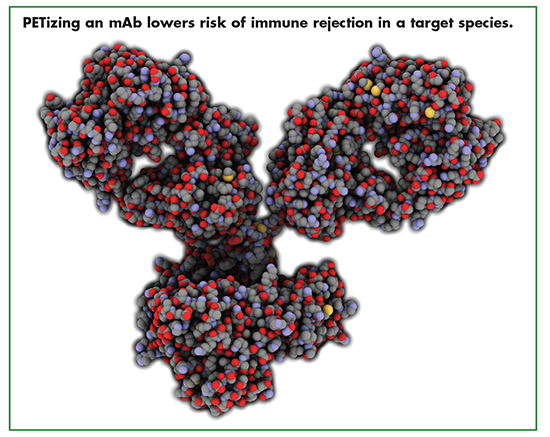 This approach differs from previous generations of antibody therapies, even those referred to as “fully human,” which are created using gene sequence engineering technologies in the laboratory. According the company, because True Human antibodies are derived from naturally occurring antibodies, they have the potential to harness the body’s natural immunity and have been developed to fight disease with increased safety, efficacy, and tolerability. XBiotech’s lead product, Xilonix™, which is in late-stage clinical development for the treatment of advanced colorectal cancer, has been fast tracked by the US Food and Drug Administration and is currently under accelerated review in Europe. Xilonix is a first-in-class True Human monoclonal (IgG1k) antibody that neutralizes the biological activity of interleukin-1alpha (IL-1α), a protein associated with the growth and spread of tumors as well as the metabolic changes that can cause muscle and weight loss, fatigue, and anxiety. Debilitating symptoms, including wasting, pain, fatigue, and anorexia, are prognosticators for overall survival in patients with advanced colorectal cancer. A pivotal Phase III study in Europe was developed to assess recovery from these symptoms to rapidly evaluate the ability of Xilonix in improving the health of patients while treating their cancer. “Xilonix represents an important advancement in the treatment of advanced colorectal cancer and may be a therapy that could be used in treating a broad range of other malignancies,” says XBiotech Founder and Chief Executive Officer John Simard. The company is also rapidly advancing a robust pipeline of True Human antibody therapies to redefine the standards of care in oncology, inflammatory conditions, and infectious diseases. 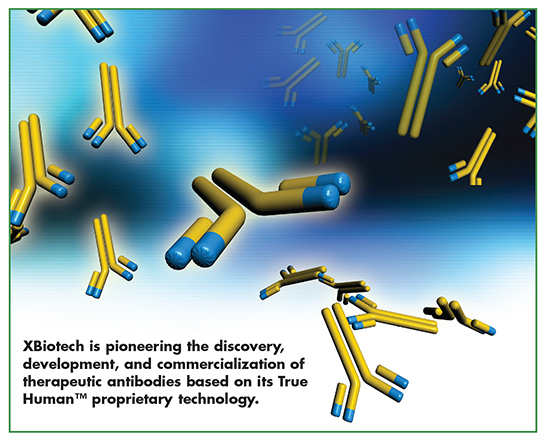 Since its founding a decade ago, XBiotech has developed the capabilities to identify, isolate, and manufacture True Human antibodies, and currently has clinical trial programs underway in nine disease categories, including cancer, diabetes, restenosis, acne, psoriasis, and Staphylococcus aureus infections. “We continue to see that our ability to rapidly and cost-effectively transition from discovery to potential breakthrough therapies is unprecedented,” says Mr. Simard. Featured-Articles/37325-Implementation-of-a-Platform-Approachfor-Early-Biologics-Development/, accessed July 8, 2016. 2. Grainger, David, Industry Voices: Platform technologies — The foundations of Big Pharma or its nemesis? Fierce Biotech, Sept. 6, 2013, http://www.fiercebiotech.com/r-d/industry-voices-platformtechnologies-foundations-of-big-pharma-or-its-nemesis, accessed July 8, 2016.